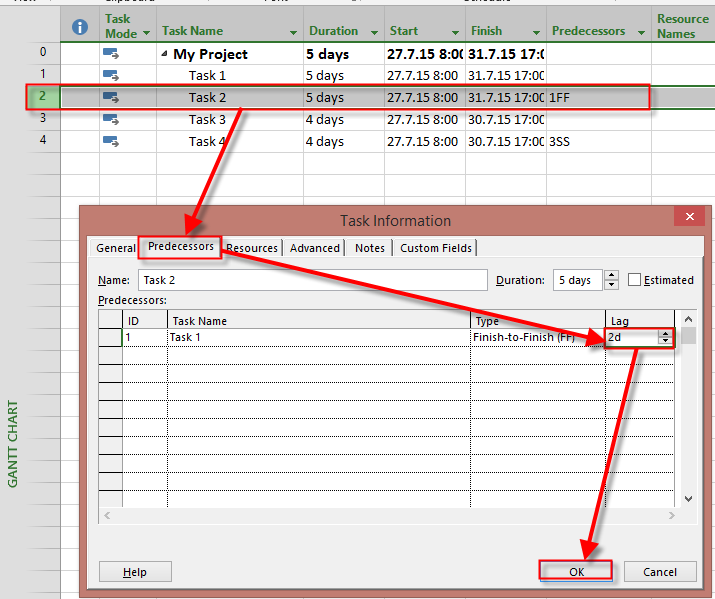 ← How to enable adding Columns in MS PROJECT 2013 Tables? Finish to Finish / Start to Start Dependencies with LAG in MS PROJECT 2013! I will show you how to do that in MS PROJECT 2013! As you can see Task 2 will have Finish date 4.8.2105, and will start two days later, so it’s Start date is postponed! Same result! So, yes you can have Lag (and Lead) with Tasks with Dependencies other than Finish to Start, but be aware of consequences! This entry was posted in MICROSOFT PROJECT, Microsoft Project 2013, MS PROJECT 2010, PMI, PRoject Management and tagged Microsoft Project 2013 - Lag. Bookmark the permalink. 2 Responses to Finish to Finish / Start to Start Dependencies with LAG in MS PROJECT 2013! Some planners do not reccoment to use lead/lag dependencies. Even i read that it is advised to use finish to start dependencies as much as possible. dear Nenad what do you think about that based on your experience? I use Lead and Lag. Lead and Lag are not Dependency type. You can use Finish to Start and combine them with Lead / Lag.